Idealliance is growing dramatically around the world. We like to call ourselves a start-up, even though our history goes all the way back to 1896, because if we stay in this mind-set, we will stay nimble, fresh-minded, focused and never rest on our laurels. G7® is the most widely utilized and sought-after specification and certification in the world. It works on every print medium, it is being revised in ISO 12647-2, and we live in an industry today where color management and process control are now “every day” words with in-house experts. Idealliance was grateful to invited by Amcor Ltd., a global packaging company, with 196 production facilities in 40 countries around the world, 35,000 employees, and annual revenue of $9.3 Billion to conduct G7 Expert Certification for their staff at the flexible packaging facility in Rinteln, Germany, followed by G7 Master Qualification for this facility for both rotogravure and litho. The staff at Amcor are simply outstanding. They had people fly in from across Europe and you can tell that this is a company that truly lives their value system as an organization. Everyone was not only brilliant, but incredibly kind, warm and welcoming. The expertise in the room and this facility was mind-blowing. The type of work they produce is for the largest brands in the world and their dedication to quality, color management and process control is paramount. I will not forget my visit to the tiny village of Rinteln. Despite being the dead of winter, there was a tremendous warmth to the place. 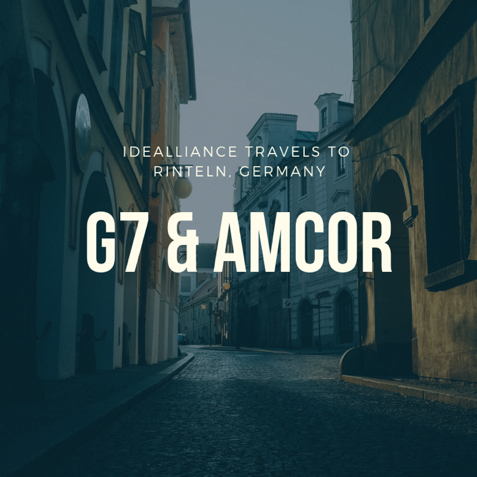 Idealliance congratulates Amcor on their significant work, achievement of G7 Master Qualification for both rotogravure and litho and we thank you for your tremendous hospitality.